Yasujiro Ozu(1903-1963) was a highly respected Japanese director who made some 54 films, films that were popular in Japan, but have been under-appreciated in the west. Ozu’s subject matter was almost exclusively middle-class Japanese family life. The exposition is straightforward, focused on domestic detail, somewhat static, and slowly builds its points through an accumulation of small events and unremarkable dialogue. Yet, the overall effect for the patient viewer is powerful understanding and insight into family psychology and the values of day to day living in the modern world. 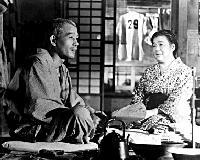 In Tokyo Story, an elderly couple travel from their provincial home to visit their adult children living in Tokyo. One son is a suburban doctor; another son was killed in the war and left behind his widow; a daughter runs a beauty salon. There is a third son living in Osaka and a daughter, a school teacher, still living at home with her parents. At one point, the son and daughter send their parents off to a spa for a few days; visiting parents interfere in the daily routine of busy people. One evening the father meets a colleague and they get drunk; the mother spends a night with her daughter-in-law, by far the most giving of their children. The visit comes to an end, they return home, and soon after the mother dies. While most of the scenes are domestic interiors, viewed from the low level of someone seated on a tatami, there are exterior bridging scenes suggesting sometimes the industrial milieu, often trains or boats in motion. This is not a film about plot. It is a film that explores the relationships between the generations with warmth and subtlety and gentleness, though the conclusion must be accepted as a very contemporary, alienated view. Ozu comments, too, on changing mores from generation to generation. The acting is superb throughout, emotions conveyed powerfully by as little as a swallow or a turn of the head, a handkerchief held in a hand. The film is full of feelings, all understated, all with the tenor of universal truth. Ozu looks at and reflects on parent’s expectations of children and children’s expectations of parents, and then weighs the expectations against the realities. By the time we spent over two hours with this family, we felt we knew them and we surely cared about them and were deeply moved.